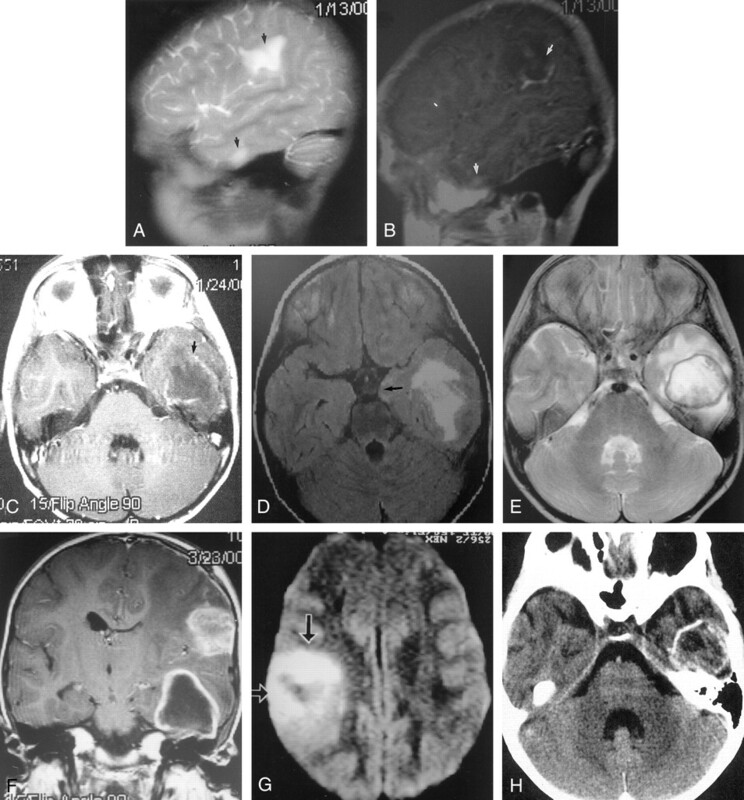 Images obtained in a 5-year-old immunocompetent girl with meningoencephalitis caused by Balamuthia mandrillaris. A, Day 1: Sagittal T2-weighted MR image reveals increased signal intensity (edema) in two lesions (arrows) with minimal mass effects. No capsule is depicted. B, Day 1: Sagittal gadolinium-enhanced T1-weighted shows patchy enhancement of both lesions. C, Day 11: Axial T1-weighted enhanced MR image reveals ring enhancement. D, Day 11: Axial fluid-attenuated inversion recovery, or FLAIR, MR image reveals increased edema in the temporal lobe lesion, with an increased mass effect, as illustrated by medial temporal lobe herniation (arrow). No surrounding capsule is depicted. E, Day 66: Axial T2-weighted MR image reveals a distinct low-signal-intensity capsule surrounding the lesion. F, Day 66: Coronal T1-weighted enhanced MR image reveals ring enhancement of the anterior temporal lesion. The more superior lesion had ring enhancement on more posterior images (not shown). The mass effect is maximal at this time. G, Day 66: Axial diffusion-weighted MR image reveals restricted diffusion in the middle of the lesion, which is typical of most cerebral abscesses. H, Day 87: Axial nonenhanced CT scan reveals a calcified rim. The mass effect is no longer present. Encephalomalacia was noted on the more superior images. 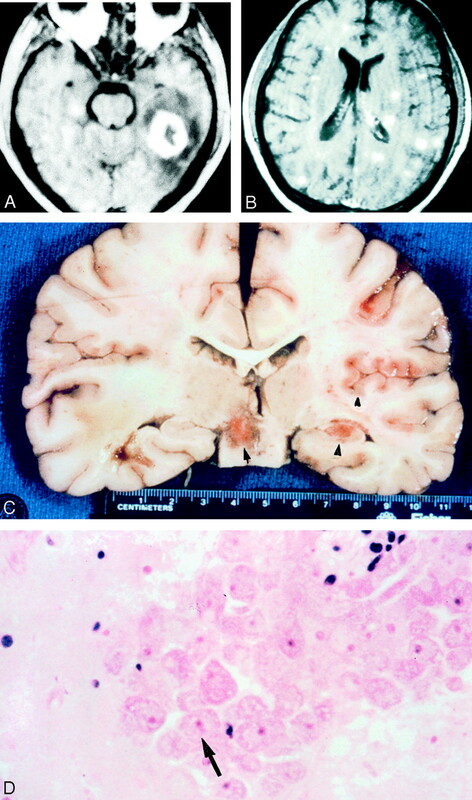 Images obtained in a 32-year-old HIV-negative man with meningoencephalitis caused by Balamuthia mandrillaris. A, Axial T1-weighted gadolinium-enhanced MR image reveals a 3-cm enhancing left temporal lobe lesion with surrounding edema. B, Axial T1-weighted gadolinium-enhanced MR imaged obtained on day 7 reveals innumerable enhancing areas of encephalitis that involve both gray matter and white matter. C, Coronal gross specimen reveals multiple areas of involvement. Note the focal hemorrhages. D, Photomicrograph reveals perivascular clustering of amebic trophozoites (arrow) (hematoxylin-eosin).